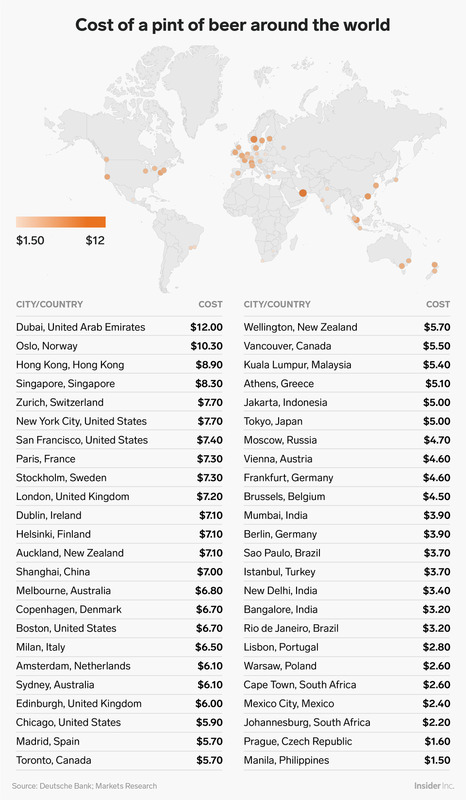 The price of a pint of beer varies from city to city. Deutsche Bank analysed the price of beer in 50 cities worldwide and found Dubai was the most expensive, with the average pint costing $US12. New York City and San Francisco were close behind, while the least expensive beer can be found in Manila at just $US1.50 a pint. If you’re looking to save money on beer while you’re travelling abroad, you might want to avoid some of these cities. Deutsche Bank recently released its annual “Mapping the World’s Prices” series, which compares the cost of everything from iPhones to sneakers in 50 cities around the world. According to the report, the most expensive beer in the world is found in Dubai, where an average pint will run you $US12. The next-costliest city was Oslo, Norway, where an average pint costs $US10.30. And two cities in the United States, New York City and San Francisco, cracked the $US7 mark for an average beer. Meanwhile, the city with the lowest average price for beer was Manila, Philippines, where you’ll only spend $US1.50 for a cold one. Prague, Czech Republic, was close behind, with an average price of $US1.60. Check out the full list below, and see other lists from the “Mapping the World’s Prices” series here.